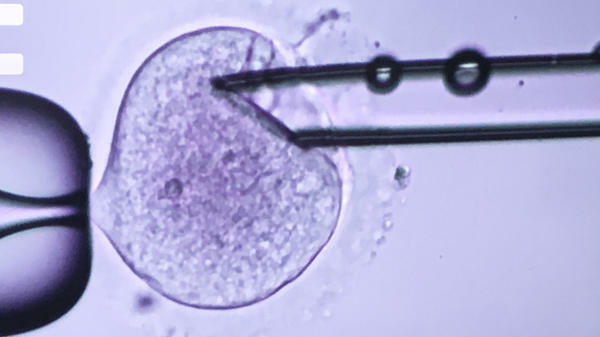 A scientist from the Nadiya Clinic in Kiev, Ukraine inserts a needle into a fertilized egg to extract the DNA of a man and woman trying to have a baby. The clinic is combining the DNA from three different people to create babies for women who are infertile. Nadiya Clinic in Kiev, Ukraine, is creating babies using the DNA of three people. The procedure can help women who are infertile have children. The clinic's procedure involves using the DNA from three people: the woman trying to have a baby; her male partner; and the egg donor who has provided 37 mitochondrial genes. 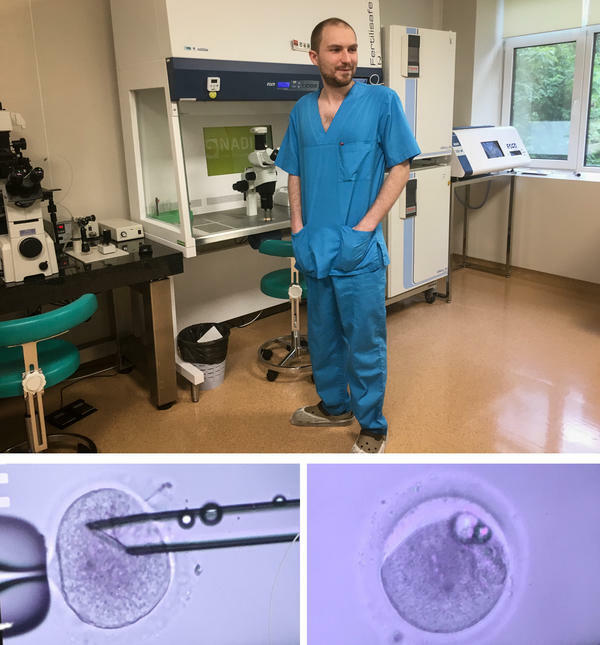 Pavlo Mazur, a clinic's embryo scientist (top) inserts a needle into a fertilized egg (bottom left) to extract the DNA of a man and woman trying to have a baby. He then transfers the DNA into a fertilized egg from an egg donor that has had most of its DNA removed. That creates an embryo (bottom right) with DNA from three different people. Dr. Valery Zukin runs the Nadiya Clinic. He says all the babies he's created appear to be healthy. "If you can help these families to achieve their own babies, why it must be forbidden?" Dr. Valery Zukin, director of the Nadiya Clinic, asks as he peers over his glasses. "It is a dream to want to have a genetic connection with a baby." I traveled to Ukraine because Zukin promised unusual access to his private fertility clinic, including the first demonstration for a U.S. journalist of how scientists create "three-parent" babies — a procedure prohibited by the U.S. Food and Drug Administration. Zukin also arranged the first-ever interview with a mother of a 15-month-old boy who is one of the four children he says he has produced this way. Three more of his patients are pregnant, Zukin says, including a woman from Sweden. Women from several other countries including Britain, Brazil and Israel are going through the process, he says. Leading ethicists and genetics researchers criticize the clinic for rushing ahead to use this method for infertility. No one knows whether children produced this way will be healthy, they say. And some worry the procedure may open the door to "designer babies." "This is pretty troubling," says Marcy Darnovsky, who heads the Center for Genetics and Society, a U.S.-based watchdog group. But Zukin dismisses those criticisms. "As a doctor I understand only one thing: We have parents who couldn't have children and now they have their own biological child. That's all," Zukin says. Zukin has helped form a company, Darwin Life-Nadiya, with a New York clinic to market the service to U.S. women willing to travel to Ukraine. Ukrainian women pay about $8,000 for the procedure; for foreigners, it's about $15,000. To show how the procedure works, Zukin sends me upstairs to the embryo lab. After putting on a sterile blue gown and booties, I meet Pavlo Mazur, a clinic embryo scientist. "We will begin," Mazur says, as he takes a clear plastic dish out of an incubator. The dish contains a 1-day-old embryo. It was created by fertilizing the egg of a woman with sperm from her male partner. The dish also holds a second embryo. This was made using the same man's sperm to fertilize an egg from another woman, who was paid to donate eggs. After sliding the embryos under a large microscope, Mazur starts a timer. He has only 15 minutes to complete the delicate procedure without risking damage to the embryos. A monitor nearby displays what Mazur sees through the microscope. A round structure comes into focus on the screen. It's one of the embryos. "You see?" Mazur says, pointing to two smaller round structures inside. They contain the DNA of the man and woman trying to have a baby. "One is from sperm. It's paternal," Mazur says. "And the second one is maternal." Mazur slowly inserts a tiny, hollow glass needle into the fertilized egg. Even though Mazur is under pressure to work fast, he can't move too quickly. "Very steady and slow," Mazur says. "We don't want to damage it, right? We want it to survive." He uses the needle to extract the would-be parents' DNA. Mazur does the same thing with the second fertilized egg, removing all the DNA — except for 37 genes known as mitochondrial DNA. Mitochondria provide energy for eggs. A defect in the patient's mitochondrial DNA might be what's preventing her from getting pregnant. So using the donor's mitochondrial DNA may be what enables the patient to produce healthy embryos and babies. "It's like an universal currency for a cell," Mazur says. "It helps for all processes within the cell." The next step is to transfer the DNA of the woman and man trying to have a child into the donor's mostly gutted embryo — empty except for the other woman's mitochondrial DNA. "And now we will just try to put the genetic material of our patient inside," Mazur says as he gently inserts the needle holding the couple's DNA and injects the genes. "That's it," he says, glancing at his timer to see there are still two minutes left. "So, you see? It's inside," Mazur says, pointing to the couple's DNA. "It will develop into embryo." 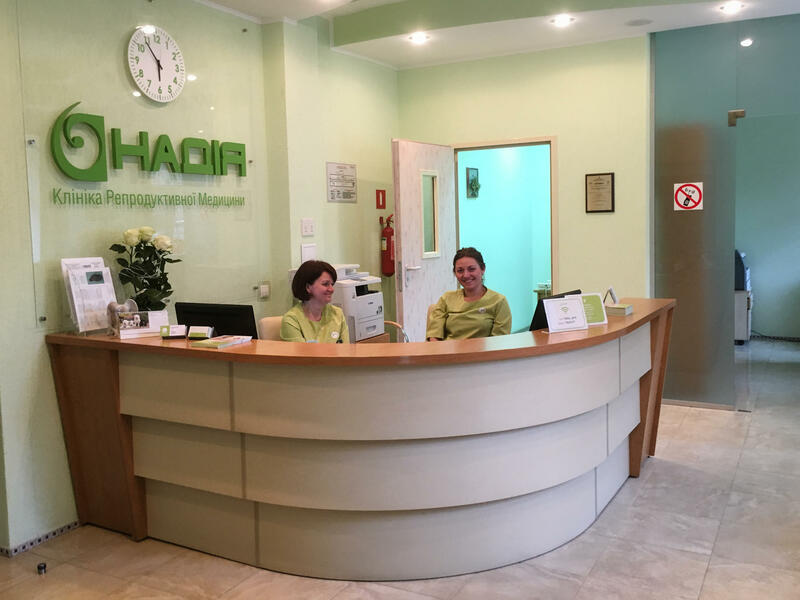 The Nadiya clinic is transferring embryos reconstructed this way into the wombs of women trying to become pregnant. So far, the clinic has tried the procedure on 21 women. Fourteen attempts failed, probably because the women were older, the clinic staffers say. But the other women either had babies or are pregnant. They were younger, but could never produce viable embryos on their own. "I adore that such technology exists. I adore that it can help some people," says Mazur. These babies end up with DNA from three different people: the woman trying to have a baby; her male partner; and the egg donor who has provided 37 mitochondrial genes. That's why they're called three-parent babies. But Mazur says that label is wrong. "These babies — they have DNA from mother and from father. So they are genetically related to their parents," Mazur says. The overwhelming majority of the baby's DNA comes from the nucleus of the cell. And those are the genes responsible for the traits that most people consider their genetic inheritance, such as their eye and hair color, height, weight and personality. The bit of mitochondrial DNA is "incomparable," Mazur says. "These children are more like their parents — not donor." Mazur will present the clinic's latest results at the European Society of Human Reproduction and Embryology's annual meeting in Barcelona in July. Some scientists are welcoming this as a potentially exciting new option for some women. "It is pioneering work," says Dietrich Egli, an assistant professor of developmental biology at Columbia University Medical Center in New York. The procedure is technically known as "pronuclear transfer." "What we can learn from their work is that pronuclear transfer may be useful for some cases of infertility," says Egli. But critics say it's far too soon to be attempting this procedure to create children. "This is really an irresponsible kind of human experimentation," Darnovsky of the Center for Genetics and Society says. Not nearly enough laboratory and animal research has been done to know if the procedure is safe, Darnovsky and others say. "We just don't know what's going to happen to these children," Darnovsky says. In the 1990s, a doctor in New Jersey injected fluid from healthy eggs into the eggs of infertile women, and some babies were born with mitochondrial DNA from three people. But that was discontinued after the FDA intervened. Only one other baby is known to have been produced using a technique similar to the one being used by Zukin. John Zhang of the New Hope Fertility Center in New York performed a related procedure for a Jordanian couple to try to prevent their child from having Leigh syndrome, a disorder caused by defects in mitochondrial DNA. That's why the procedure was developed — to help women carrying mitochondrial disorders have healthy children. In severe cases, these disorders can be fatal. A U.S. National Academy of Sciences panel concluded it could be ethical to attempt the procedure for this purpose. But because the FDA won't allow it at all in the United States, Zhang went to Mexico as part of his effort to create the baby for the Jordanian couple in 2016. Doctors in the United Kingdom have started trying the technique to prevent mitochondrial disorders. But the British doctors are being allowed to try to make only one baby at a time as part of a tightly regulated research program. 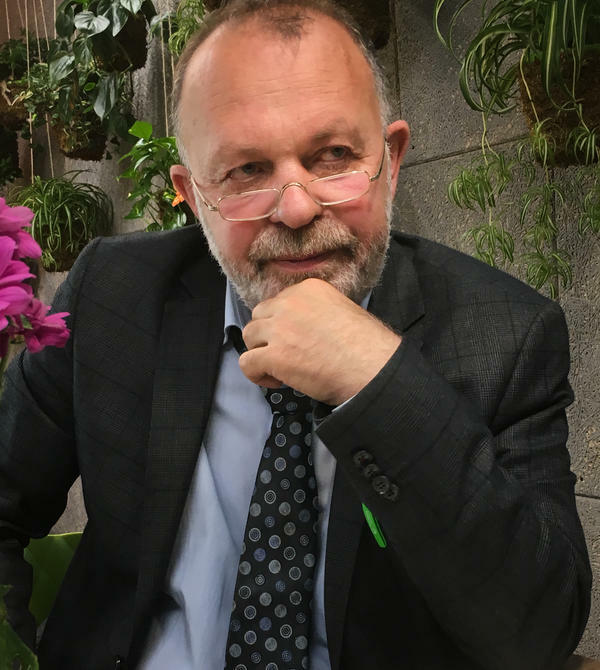 Zukin says he received approval for a five-year research program from the Ukrainian Postgraduate Medical Academy, which is under the auspices of the Ukrainian Ministry of Public Health. But Zukin concedes the procedure is far less regulated in his country. Nevertheless, he makes sure all the women understand they are undergoing an experimental procedure. "We explain everything to the families. And not all families give permission for providing this experimental procedure," he says. Because mitochondrial DNA can be inherited, Darnovsky worries the procedure is crossing a line that long has been considered taboo: making changes in human DNA that can be passed down to future generations. One fear is that a mistake could create a new disease that could be inherited. Mitochondrial DNA is inherited from the mother. Zukin already has used the procedure to produce one baby girl — a girl who could one day pass the mitochondrial DNA to her own children. Darnovsky worries the procedure could also open the door to creating babies who are genetically modified for other reasons. "What we're seeing is a fast slide down a very slippery slope toward designer babies," Darnovsky says. "We could see parents feeling eager to give their children traits like greater strength, needs less sleep. Some people are saying that, 'Yes, there are genes for IQ and we could have smarter babies.' "
Zukin dismisses speculation about designer babies. He says he's interested only in helping women who are infertile have genetically related children or prevent mitochondrial diseases. And so far, all the babies he has created appear to be perfectly healthy, he says. The only way to know whether the procedure works and is safe is to try it, he argues. He hopes to figure out how to make the procedure work for women suffering from age-related infertility as well, which would help far more women. "If you would like to swim," he says, "then, first of all, you must jump in the water." A clinic in Ukraine has started making babies with DNA from three different people. They're doing this to help infertile women have children, but there are big concerns about so-called three-parent babies. NPR health correspondent Rob Stein went to Kiev to find out more. He is the first foreign journalist to be allowed inside the lab. ROB STEIN, BYLINE: As I set out to find this three-parent baby clinic, even my taxi driver has a hard time finding it. 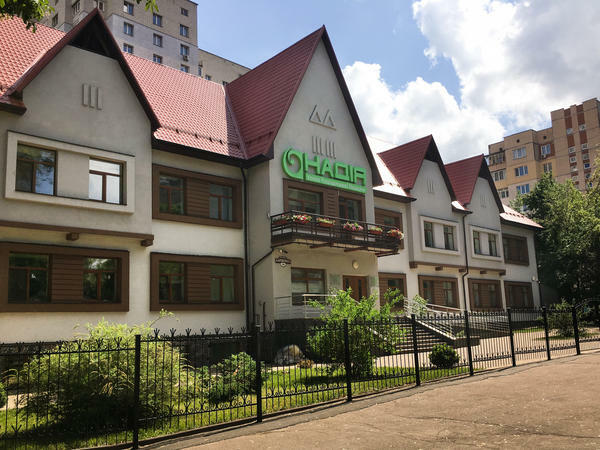 Turns out the Nadiya Clinic is tucked away in a little side street on the outskirts of downtown Kiev. Nadiya means hope in Ukrainian. Dr. Valery Zukin runs the clinic. STEIN: Hi. I'm Rob Stein. Nice to meet you. ZUKIN: Yes. Nice to meet you. STEIN: Zukin takes me to his office to explain why he's doing something so controversial. ZUKIN: The patients with infertility came in the infertile clinic, and the doctors, they could see that the embryo stopped development at a very early stage. ZUKIN: They never - they could not achieve the pregnancy, never. STEIN: So Zukin decided to try something risky, a technique using DNA from three different people that was invented to help women carrying devastating genetic disorders have healthy babies. ZUKIN: If you could help these families to achieve their own babies, why would it must be forbidden? STEIN: To show me how it's done, Zukin sends me upstairs to the clinic's embryo lab to meet the clinic's embryologist, Pavlo Mazur. PAVLO MAZUR: Nice to meet you. Mazur takes a clear plastic dish out of an incubator and slides it under a big microscope. I can see what he sees on a big monitor. A big, round bubble comes into focus on the screen. MAZUR: That's a one-day embryo. STEIN: That's a one-day embryo right there, yeah. The procedure starts with an egg from the woman trying to have a baby that's been fertilized to make a 1-day-old, single cell embryo. MAZUR: That's single cell with two nuclei inside it. You see? One, and two. One is from sperm. It's paternal. And the second one is maternal. STEIN: So that's the father's DNA and the mother's DNA. Right. STEIN: A thin glass needle appears on the screen. Mazur slowly inserts the needle into the fertilized egg. MAZUR: Very steady and slow. STEIN: Why steady and slow? MAZUR: We don't want to damage it, right? We want it to survive. STEIN: He then uses the needle to extract the mother and father's DNA. Wow. So that's - you just pulled out the DNA? STEIN: So that's the mother's DNA and the father's DNA? STEIN: And you just sucked it right out of there? STEIN: Mazur does the same thing with a second fertilized egg, removes almost all the DNA. But this one, it was created from another woman paid to donate eggs. MAZUR: And now we will just try to put the genetic material of our patient inside. STEIN: I see. So the other one's been emptied out, and it's waiting for the patient's DNA? STEIN: Mazur gently inserts the needle into the donor's healthy egg and injects the genes of the couple trying to have a baby. MAZUR: So you see it's inside. STEIN: So that's the mother and father's DNA inside the donor egg? STEIN: And it looks OK? MAZUR: Yeah. It will develop into embryo. STEIN: Wow. It's almost like a DNA transplant. STEIN: The clinic's mostly treating Ukrainian women but is marketing this to women anywhere, charging those coming from other countries about $15,000. So far, the Nadiya Clinic doctors say, they've made four babies this way, and three more women are pregnant. MAZUR: I adore that such technology exists. I adore that it can help some people. STEIN: But these babies, they end up with a tiny bit of DNA left over from the woman who donated the egg. That DNA provides the egg's energy and may be what helps women finally get pregnant. That's why they're called three-parent babies. But Mazur says that label's wrong. MAZUR: These babies, they have DNA from mother and from father. So they're genetically related to their parents, but a small, tiny part of DNA from donor. So it's incomparable. Your look, your hair color, your eyes color, your height, your weight and so on. These childrens are more like their parents, not donor. STEIN: Some infertility doctors are welcoming this as a potentially exciting new option for some women. But critics are not. MARCY DARNOVSKY: This is really an irresponsible kind of human experimentation. STEIN: Marcy Darnovsky heads a genetics watchdog group called the Center for Genetics and Society. First of all, Darnovsky says, no one knows if this is safe. DARNOVSKY: We just dont know whats going to happen to these children. This is pretty troubling. STEIN: The procedure's banned in the United States. British doctors just started trying this, but only to prevent genetic diseases, and only one baby at a time as part of a tightly regulated research program. No one else is just selling it to treat infertility like the Ukrainian clinic. And that's not all, Darnovsky says. DARNOVSKY: What we're seeing is a fast slide down a very slippery slope toward designer babies. STEIN: That's because the DNA that's left over in the donated egg can be passed down by any girls to future generations. So Darnovsky worries this could open the door to making babies that are genetically modified for other reasons. DARNOVSKY: Then we could see parents feeling eager to give their children traits like greater strength, need less sleep. Some people are saying that, yes, there are genes for IQ, and we can have smarter babies. STEIN: Zukin says he's just trying to help desperate families have genetically related babies. And so far, he says, all the babies born this way appear to be perfectly healthy. ZUKIN: It is a dream to have a genetical connection with the baby. STEIN: Zukin says he's teamed up with a clinic in New York to start offering this procedure to American women willing to travel to Ukraine. Rob Stein, NPR News, Kiev. Transcript provided by NPR, Copyright NPR.